Smart Rules help automate a major chunk of the administrative duties of a support team. From Automating complex category workflows to ticket closures, Smart Rules can help save agents' time and allows them to focus more on providing quality customer support. Note: Page Visibility is governed by a permission "Manage Smart Rules". If you are not able to see this section, contact your administrator. 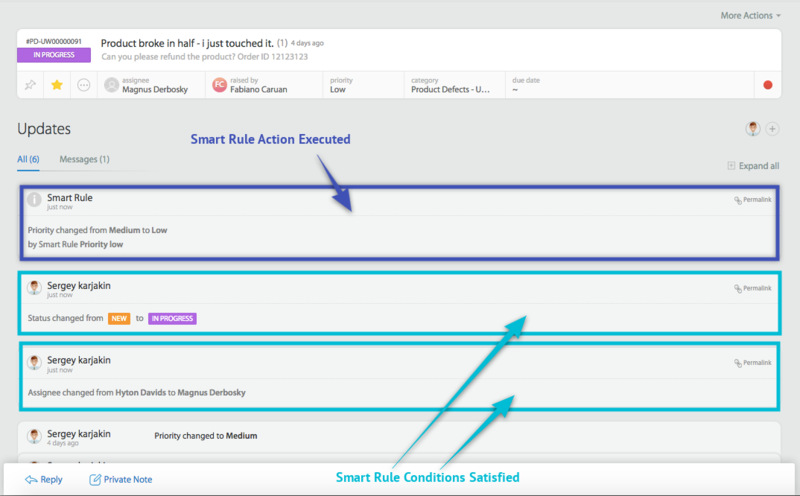 Smart Rule Action refers to the process you wish to automate. You can only perform one action per Smart Rule. Sends configurable SMS to recipients specified. This action is available only to account administrators who have successfully set up the SMS feature. Sends customizable Email to the recipients specified. Adds agents as Subscribers to tickets. Automatically hits a particular URL/Webhook. Sets the Status of the ticket to the value specified. Sets the Priority of the ticket to the Value Specified. Adds specified Tags to a ticket. Sets the Due Date of the ticket to the date specified. Clears the Due Date of the ticket. Dynamically Sets Assignee of a ticket based upon ticket creation, first staff reply and last staff reply. All Smart Rules execute if the conditions defined are fulfilled. Conditions can be grouped into Match All or Match Any. For Match All, all of the conditions specified needs to be TRUE for the Smart Rule to get executed. For Match Any, any one of the conditions specified needs to be TRUE for the Smart Rule to be executed. Choose the action that will be performed by the Smart Rule. Meet Subsequent Actions criteria if any. Enter name and description for the Smart Rule. Choose applicable categories and associate an appropriate Work Schedule. Choose if the Smart Rule needs to be executed only once. Finish Smart Creating Smart Rule. Click on the desired Smart Rule to view/edit in the Smart Rules page. Find all the information about that Smart Rules in the "Quick Preview". Click "Edit" to edit the Smart Rules information. Click "Delete" to delete the Smart Rule. To know how Smart Rules work in HappyFox Classic, refer to the document attached.